Boston Double Homicide Suspect Captured By SHERIFF VICTOR HILL’s Elite Fugitive Squad & U.S. Marshals. Murder suspect Nicholas Antoine found out the hard way yesterday that he had chosen the wrong county to hide in when he and his girlfriend found themselves surrounded at a residence in Hampton by members of the U.S. Marshals Service and Sheriff Victor Hill’s elite Fugitive Squad. 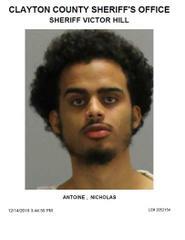 Antoine was wanted by the Boston Police Department for two counts of Murder, Ammunition without FID Card, Firearm within 500 Feet of Dwelling, and Firearm, Carry without License. These charges stem from an incident which occurred on June 30th, 2018 in the neighborhood of Brighton in Boston Massachusetts where officers responded to an early-morning report of shots fired. Upon arrival at the scene, officers found two adult males suffering from gunshot wounds. Both males were pronounced dead at the scene. Investigation into the murders led the Boston Police Department to identify the shooter as Nicholas Antoine. In addition to the apprehension of Nicholas Antoine, the U.S. 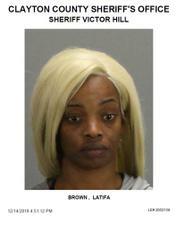 Marshals and the Fugitive Squad apprehended Latifa Brown at the same residence in Hampton. Brown was wanted out of the Stone Mountain Police Department for a Violation of Probation on a traffic offense. Both suspects while waiting to be extradited back to where they committed their crimes are now facing the wall at Georgia’s toughest para-military jail now better known as the “Hill-ton”. Note: The Clayton County Sheriff’s Office mourns with all law-enforcement agencies over the loss of our fallen brother Officer Edgar Isidro Flores of Dekalb County PD. Our badges will remain covered and our flags will stay lowered until this brave soldier is laid to rest.